50 Years in Space - William F. Ballhaus, Jr.
Dr. William F. Ballhaus, Jr., is president and chief executive officer of The Aerospace Corporation, an independent, nonprofit organization dedicated to the objective application of science and technology toward the solution of critical issues in the nation's space program. The Aerospace Corporation has nearly 4,000 employees and annual sales of over $800M. 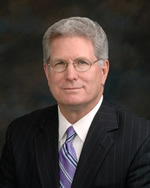 Dr. Ballhaus joined Aerospace as president in September 2000 after an 11-year career with Lockheed Martin Corporation. He became president and CEO on May 1, 2001. At Lockheed Martin Dr. Ballhaus served as corporate officer and vice president, Engineering and Technology. In this position he was responsible for advancing the company's scientific and engineering capabilities, and for overseeing research and engineering functions. Prior to his tenure with Lockheed Martin, Dr. Ballhaus served as president of two Martin Marietta businesses, Aero and Naval Systems (Baltimore, 1993-1994), and Civil Space and Communications (Denver, 1990-1993). He also was vice president and program director of Titan IV Centaur operations at Martin Marietta Space Launch Systems (Denver, 1990). Before joining Martin Marietta, Dr. Ballhaus served as director of the National Aeronautics and Space Administration's (NASA) Ames Research Center at Moffett Field and Edwards Air Force Base, California (1984-1989). He also served as acting associate administrator for Aeronautics and Space Technology at NASA Headquarters in Washington, D.C. (1988-1989). Dr. Ballhaus held several other positions at NASA Ames, including director of Astronautics (1980-1984) and chief of the Applied Computational Aerodynamics Branch (1979). As a research scientist at Ames (1971-1978), Dr. Ballhaus published more than 40 papers on computational aerodynamics. He is a graduate of the University of California at Berkeley where he earned a Ph.D. in engineering and bachelor's and master's degrees in mechanical engineering. Dr. Ballhaus is a member of the Defense Science Board and the National Oceanic and Atmospheric Administration's Science Advisory Board. He also is a member of the National Academy of Engineering and completed serving a second three-year term as a councillor of the academy in June 2007. Dr. Ballhaus is an honorary fellow of the American Institute of Aeronautics and Astronautics (AIAA) and served as AIAA president for the 1988-1989 term. He is a fellow of the Royal Aeronautical Society and the American Astronautical Society, and is a member of the International Academy of Astronautics. He serves on the Jet Propulsion Laboratory Advisory Council and on the board of directors of the Space Foundation. He served on the Air Force Scientific Advisory Board from 1994 to 2001 and was board co-chair from 1996 to1999. At Charles Stark Draper Laboratory Dr. Ballhaus is one of the 47 "members of the corporation" who oversee the governance of the laboratory. In addition, he serves on the senior council of the NASA Alumni League and is a member of the science or engineering advisory boards at UC Berkeley, the University of Southern California, and the University of California at Los Angeles. Dr. Ballhaus' awards and honors include the presidential ranks of distinguished executive and meritorious executive, conferred by President Ronald Reagan; the NASA Distinguished Service Medal; the Air Force Exceptional Civilian Service Medal; the Air Force Scroll of Appreciation; the National Reconnaissance Office Gold Medal; the Air Force Association's Gen. Bernard A. Schriever Award for space leadership; the National Defense Industrial Association's Peter B. Teets Award for championing the advancement of national-security space; the Distinguished Engineering Alumnus Award from UC Berkeley; AIAA's Lawrence Sperry Award and Von Karmen Lectureship; the Arthur S. Flemming Award from the Washington, D.C., Junior Chamber of Commerce; the Distinguished Executive Service Award from the Senior Executives Association; and the Eminent Engineer Award from Tau Beta Pi Engineering Honor Society at UC Berkeley.